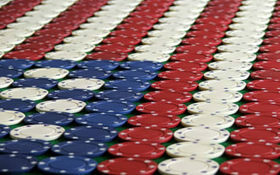 The hype behind the legalization of online poker in the U.S. continues as many companies stand at the ready in hopes of entering the U.S. market. I’ve been one that has said since April 15th that legalization is a lot farther off than anyone is anticipating. Here are five things that I think you will see before online poker is legal throughout the United States. While I am not convinced that Full Tilt Poker will be able to pull off the sale before September 15th, I do think that at some point they will pull off the sale and pay back U.S. players. Six months was the timeframe I gave U.S. sites to pay back players. Pokerstars surprised everyone with the speed they repaid us. Full Tilt is still on track to pull that off, but they need to get things rolling soon. The World Series of Poker continues to grow each year and is actually beginning to run out of space it seems at the Rio. Granted, part of that is due to expanded offerings like deep stack daily events, but space is again becoming limited on certain days. As many of you know, there have been rumors of the Rio being sold in the past, and we may see that happen. Even if it does not, I would no be surprised to see the Rio in new digs before online poker is legal in the U.S.
New Jersey state Senator Raymond Lesniak is reintroducing his intrastate online gaming bill into the Senate on Thursday. This bill was vetoed earlier in the year by N.J. Govenor Chris Christie, but Christie did leave the door open for the legislation if the bill was tweaked or even submitted to the citizens of the state for a referendum vote. As such, I think that we will see either some type of tweaked bill pushed through that will address Christie’s concerns or maybe even that referendum vote held. The legislature wants online gaming, so now all they have to do is find a compromise that the governor is happy with. The Epic Poker League is in it’s first season and they will complete their first season. If the league will continue past that is anyone’s guess. However, I do not see the league choosing to continue if it is in massive debt without any chance of recouping their losses in a reasonable amount of time. The league will either take off or it will fold up, one or the other. They will not turn out like other leagues that are struggling or reorganizing to stay afloat. I think the people running the league are too smart for that. With that said, if the league makes it past year one, I expect we will have multiple league champions crowned before online poker is legal in the U.S.
Online poker will not be legalized in the U.S. in 2011. Regardless of the hype, there just hasn’t been enough progress toward legalization to get it done this year in my opinion. Next year, the bill has a chance of passing, but we will also be in an election year. My opinion on the chances of it passing next year are no better than 40%. Even if it passes, it would be 2013 at earliest before we see the first legal sites accepting players in all likelyhood. I still think that 2013 is the earliest we will see online poker legislation. The election will be out of the way and the next President will be looking for ways to boost job growth and the economy. Yes, I said new President. I do not see President Obama having any chance of a second term. I also believe that his losing the election will be the best outcome for online poker legislation due to the struggling economy and the need to grow jobs. I realize that many of you do not like my predictions regarding when online poker will be legalized, but I am a man of fact and reality and not one of hype. I see online poker getting legalized somewhere during 2013 or maybe 2014, and not anytime sooner. Would I like to be proven wrong? Certainly. However, I won’t hold my breath for Congress to act any faster than normal. This entry was posted on Thursday, August 25th, 2011 at 5:33 am and is filed under Poker News. You can follow any responses to this entry through the RSS 2.0 feed. You can leave a response, or trackback from your own site.